When you need a package delivered, FedEx is a company you can trust to get the job done. Starting in 1971, the company continues to be one of the world’s top delivery services. Before sending your shipment through this top-rated company, you might want to know how much it will cost. This article contains everything you need to know about FedEx shipping rates and how your delivery options affect the price. We’ve also included a few ways to help you save money at the end. There are a few things that can change the price of your FedEx shipping rates. Since each package is different, it is hard to determine precisely what you will pay without using the company’s rate sheet or finding out over the counter in one of their locations. The size of your package is one of the first factors to consider. The larger the delivery, the more you will end up paying. The same goes for the weight of any shipment. Next, how quickly you need the package delivered plays a role in the price. The faster you want someone to receive the delivery, the higher your cost. Shipping times are guaranteed are FedEx with the promise of your money back if they do not reach the destination on time. Finally, some add-ons cost extra like specific packing or signature service. All shipments come with time-definite deliveries as well as tracking, so you might not need to pay for anything else depending on the items you’re sending. Depending on the size and weight of your package, your delivery may be subject to additional fees. For instance, any package over 70 pounds has an additional handling surcharge of $12. Here are the most common that residential packages run into. Before the beginning of 2017, FedEx used a different calculation to determine dimensional weight. At the time, their formula multiplied the length, width, and height of every package in inches before dividing the total number by 166. January second of 2017 marked a change in that calculation, lowering the number used to divide to 139. Dimensional weight applies to any FedEx shipping rates for Ground and Express packages in the United States as well as Puerto Rico. While these rates vary, there are two set prices in this bunch. First, delivery area surcharges cost $4 for each package you send ($4.40 for express delivery). For commercial packages, the price drops to $2.55/$2.70 each. Any shipment headed to Hawaii or Alaska is excluded in these rates, using the standard FedEx pricing chart instead. If you plan to ship a package over twelve feet, then extreme length rates come into play. Since these items take up a greater amount of space, they come with an additional fee of $85. You can expect to pay up to $150 depending on how large your package is. Another 2017 change to shipping rates, FedEx now adjusts the cost you pay for fuel weekly. The price is based on your delivery choice. If you choose Express shipping, then the cost of fuel is compared to how much a gallon of kerosene jet fuel costs. If you choose ground, then your cost is based on average highway mile-per-gallon prices of the company’s diesel trucks. You can choose from standard Same Day and City Priority for this option. Both are offered 25/7 year-round, ensuring your delivery arrives at its destination as quickly as possible. City Priority delivers packages within a 60-mile radius in under seven hours. The shorter the distance, the quicker FedEx promises to deliver your shipment. For packages under fifteen miles, they drop it off at its final destination within two hours. To use this priority service, you must live in and send your package to the same metro area. You also need a FedEx account to choose this option. Alternatively, you can choose City Standard and have your package delivered by 8 p.m. Regular Same Day deliveries ship across the country to all 50 states. This service ensures your package arrives by 8 p.m. as well, as long as you give it to them before the cutoff time that day. For heavier packages (anything over 150 pounds), you’ll need to use Same Day Freight. Aside from the weight change, there’s no difference between the two services. However, there is a $140 handling surcharge for freight deliveries. The Next Day option delivers your package overnight. Depending on the urgency, you can choose to have your shipment delivered first thing in the morning, anytime in the morning, or in the afternoon. This is a step above standard shipping times, putting a slight rush on your delivery. You can choose between morning and afternoon for any two-day delivery. Three-day deliveries are delivered in the afternoon. Ground is the most popular option when there are no time constraints. Packages are delivered in one to seven business days depending on the distance they must travel. This option relies on FedEx trucks, which means your shipping rate is easier to calculate. Keep in mind that FedEx offers a money back guarantee on all of their promised delivery times, no matter which option you choose. If you want to save a little money, then it might make the most financial sense to choose their Ground option. There are a lot of options to choose from when sending a package through this delivery service. Depending on your choices, FedEx shipping rates can vary wildly. However, the company does offer a flat-rate option. If your package weighs less than 50-pounds, then you don’t have to pay for the weight of the item. Instead, you can pay for the box or envelope that fits your items. This is an excellent way to save money on rates and fees. Flat-rate packages start as low as $7.65 for a padded envelope, reaching as high as $28.50 for a triangular tube. Each has unique dimensions, so make sure to measure your delivery before picking one out. Since each situation is unique, determining costs outside of flat-rate shipping can be tricky. FedEx does provide a list of zip codes with area surcharges and a current rate page that can help you estimate what your shipping rate may be. 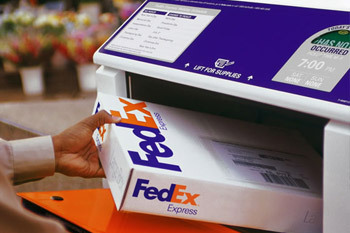 For a full list of surcharges, rates, and fees, follow this link to FedEx’s current rates page. You can also use their rate finder service to get an estimate. The easiest way to save money on shipping rates is through FedEx’s flat-rate service. The cost of the box is far less than what you would end up paying with surcharges and fees, which keeps their service wallet-friendly. Even then, there are more ways to keep your cost as low as possible. Sometimes, you need to have a package delivered by a certain time and date. Maybe you need to deliver a birthday present or are sending a product to a client. In these instances, faster delivery options are the way to go. However, anything that isn’t time sensitive can quickly be sent via FedEx Ground. With delivery times ranging from one to seven business days, your recipient won’t have very long to wait. It’s impossible to shrink an object, but there is a way you can cut down on the size of your package. Try not to leave an excess room in the box. Aside from saving a few dollars, this also helps to keep your items safer during transit. At the same time, too much packing or packaging can increase the item’s weight. While it’s highly recommended to place padding on every side of the box, there’s no need to go to extremes to secure the item inside. Choosing a smaller box helps to ensure your article is held tightly in place. Every package comes with tracking, which is what most people look forward to when ordering an item. Unless the item is highly valuable, there isn’t much of a need to have the person sign for it at the door. This eliminates any fees associated with numerous delivery attempts. You may want to skip the company’s insurance, called Declared Value, as well. This is an excellent option when shipping expensive or valuable items, but it isn’t always necessary. Packages come with a standard $100 insurance already, providing peace of mind on most shipments. Hey Buddy!, I found this information for you: "FedEx Shipping Rates: Determining Costs, Factors, Shipping Options". Here is the website link: https://all2door.com/fedex-shipping-rates-guide/. Thank you.